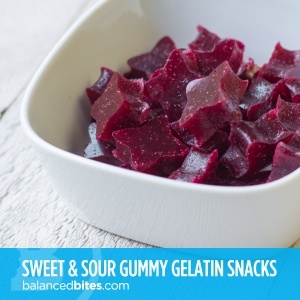 Are you trying to get more gelatin into your life? Well, then look no further as these are super easy to make and delicious as well! This is a variation of Balanced Bites’ recipe. In a blender, combine the berries, lemon juice and Dynamic Greens until no visible skin or large pieces of berries appear. Pour the mixture into a glass or ceramic dish, preferably 9×12″ or so. The smaller the pan, the thicker your gummies will be. For thinner gummies (to cut into “worms,” for example), use a larger pan.